When you start to think about remodeling your kitchen, you probably begin to feel a little bit overwhelmed. There’s just so much you can do! So many colors, shapes, and sizes of appliances, flooring, countertops, and cabinets are available in today’s world that it can be difficult to pick and choose pieces that work together and complement each other. Fortunately, there are a few simple ways that work well to add a pop of your favorite color into your kitchen without it being too overwhelming. 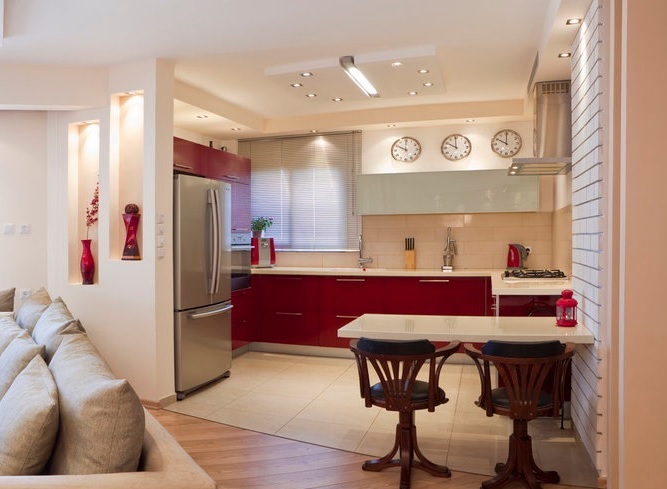 Try implementing these ideas into one of the most important rooms in your home in Columbia, Maryland, and don’t be surprised if you find yourself enjoying your kitchen more than ever before! Fortunately, there are a few simple ways that work well to add a pop of your favorite color into your kitchen without it being too overwhelming. While colorful fabrics may not be the first thing that comes to mind to include in your Columbia kitchen, they can be a fun way to add a little bit of color through barstool or dining chair seating, curtains, a table runner, or sink and cabinet skirts. Whether you prefer plaids, florals, or solids, Columbia Paint Company has a variety of fabrics including brands like Thibaut, Duralee, and Kravet. Our designers can help you find the perfect fabric to coordinate perfectly with the other colors in your kitchen. An accent wall can be a great way to spice up a boring kitchen, and it’s fairly simple too. An accent wall is simply a wall painted a different color, or designed differently, than the other walls in the room. It draws the eye in and gives an aesthetically pleasing touch to your kitchen. Consider painting the wall behind the majority of your cabinetry, or just try standing in your entryway and seeing which wall your eye automatically goes to first. We have a great selection of Benjamin Moore paints and beautiful Thibaut, York, and Brewster wallcoverings that are sure to look amazing in your kitchen. White is a popular, traditional color for kitchens. It’s associated with cleanliness, and as the main color in your kitchen, it can actually create the illusion that your kitchen is bigger than it actually is. However, without a little bit of color mixed in, a white kitchen can come off as boring and bland. The good thing is that white has the ability to make other colors really stand out! If you start off with a white base, your options as far as colorful accent pieces are limitless! Columbia Paint Company is your one-stop shop for all of your home-decorating needs in Howard County. From fabulous Hunter Douglass window treatments to beautiful Benjamin Moore paint products, we have everything you need to make your dream home design a reality. Schedule an appointment with our design consultant today!